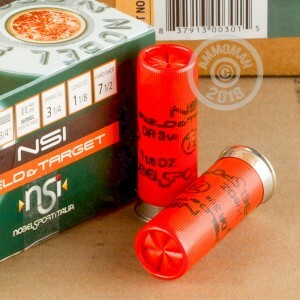 This 12 gauge ammunition from NobelSport is equally at home blasting apart clays or downing small birds and other game. These 2-3/4" shells come in boxes of 25 and fire a 1-1/8 oz. shot column at a muzzle velcotiy of 1,255 feet per second. 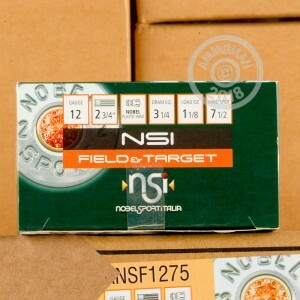 NobelSport ammo is manufactured in Rivalta, Italy and exported all over the world. It is one of the top sporting ammunition brands thanks to its consistent production quality and reasonable price. Don't be afraid to grab as much ammo as you need at AmmoMan.com, where all orders over $99 ship for free!